Clean up your house, garage shed and property by hiring scrap metal pickup in South Bend IN services. 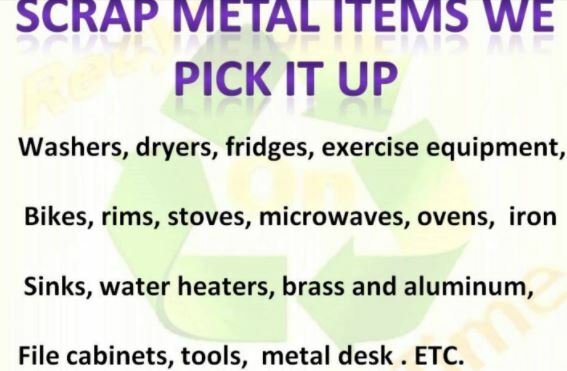 If you were to have a good look through all of the cupboards and disused rooms of your house, in your garage, in your shed, under the house and anywhere else where you may have dumped rubbish there is a pretty good chance that you will find some scrap metal. Not only will getting rid of all this unwanted scrap free up space at your home, but it will also make the whole area look much nicer. If you are planning on moving or renting out your home, you may also want to clear out all of the scraps to make it much more presentable to potential buyers or renters - people do not want to live in a house whose yard is littered with scrap. If you are moving out hire the services of South Bend Junk Removal and they will take care of your scrap metals. If South Bend Junk Removal takes care of scrap metals, you will improve the safety of your home and property. Young children are very mischievous and adventurous, especially when it comes to playing time - they play all sorts of games from hiding and seek to cops and robbers. If you have left old scrap appliances lying around your yards, such as a refrigerator or a washing machine, your children may be tempted to climb in and play on them. While this may seem like a fun idea at the time, playing in or near scrap metal poses serious safety risks. ​It is not only your children's safety that the removal of scrap metal can ensure - adults and even pets can be injured if they bump into sharp pieces of scrap that have been left lying around. Whilst an adult will have the sense to seek medical attention should you injure yourself on some discarded scrap; your pets will simply wait for the wound to heal, which could result in even worse health problems. If you have scrap metal around your home, there are plenty of reasons why you should get rid of it - not only will it clean up your property and ensure that it is looking is best, it will help to ensure the safety of your family, friends, and pets when they are playing outside or enjoying your home. Not to mention that you can make a nice little profit on whatever scrap you sell on to a dealer. South Bend Junk Removal professionals team will load your car on their tow truck and take it to clean away, ensuring that all usable parts, especially the steel components, are recycled. Once the junk car removal company has your car at the metal recyclers, fluids are drained, the tires (also recyclable for other purposes) are taken off, and the battery is removed.